EFCC releases statement explaining why it visited the premises of the Sun newspaper – Royal Times of Nigeria. 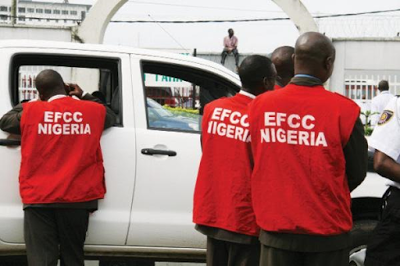 On Monday, EFCC operatives stormed the premises of The Sun newspaper. In this statement released later in the evening, the agency explained why its operatives visited the publishing house. Operatives of the Economic and Financial Crimes Commission, EFCC, in the early hours of today, June 12, 2017 visited the head office of the Sun Newspaper in Lagos. The visit which lasted for less an hour was part of routine efforts to ascertain the state of the assets of the publishing company which is subject of subsisting interim forfeiture order. Prior to the visit, the Commission had written to the management of the company to account for its management of the assets for the period of the subsisting court order. Contrary to claims in a statement released to the media by the management of the Sun, no staff of the media outfit was molested or intimidated for the few minutes that operatives of the Commission spent in the premises of the company. The claim that “EFCC operatives subjected our staff to crude intimidation, psychological and emotional trauma, even as some of the men accused our organization of publishing pro-Biafra, Boko Haram , and Niger Delta Militant stories ,” is strange and clearly the figment of the imagination of the Sun.